One of the best parts of Erin and Mike's wedding was their awesome dessert table! Colorful and eclectic, this station was unique, exciting, and oh-so-sweet! Take a look at some of the amazing images from Ryan Phillips Photography! 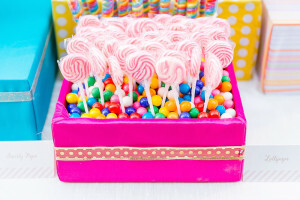 Dessert tables are the hottest thing on the market right now- from weddings to mitzvahs to corporate to retirement parties, these sweet tables are popping up everywhere! We gathered some of our most fun fabrics and mixed them with different ribbons and shimmery fabrics to create the backdrop for Lola Love's Sweet Shop! We so love the way that Prim & Pixie's artwork and designs came together for this look! Our florals were just as fun and exciting! We used bright colored tulips, peonies, billy balls, roses, and dianthus for extra bursts of floral color! 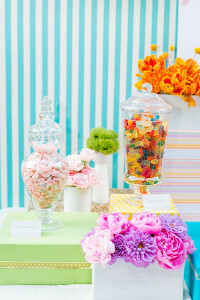 The key to a great dessert table is utilizing your space effectively, and that sure happened at this sweet shop! We had so much fun creating different platforms covered in gold shimmer and colorful fabrics.